A 5 Day Blastocyst (#2 of 4) was transferred back home to my warm uterus today. The doctor gave me 2 lovely pictures, 1 of the embryo and one of the embryo inside my uterus! They graded the Blastocyst and told me what the numbers were, I don’t know why I can’t remember them but he said that they were all the highest grade possible and the blastocyst was expanded. It feels like I’ve been waiting for this day forever. 3 months to be exact, preparing, planning, waiting, waiting, It’s finally came and gone so quickly. It’s strange to think about how many hours I have put into preparing for this one procedure that take a whole 5 minutes tops. I am super excited and beyond blessed to even have the opportunity to be here, with this huge ray of hope. The day started early, at 5:45. I just couldn’t sleep any more. I fed the dogs, put on some work out clothes and did 30 minutes of yoga. After that I made my tea for the day and ate a little breakfast, hard boiled egg and half of a grapefruit. I cut up my pineapple for the next 5 days and put a piece away for after transfer. I washed the dishes, cleaned the counters and swept the floor. On my way out the door I fed the chickens and rabbits and changed their waters. I had a 9 am appointment with my acupuncturist, a 40 minute drive away. On my way over I listened to some MindfulIVF meditation. Acupuncture went well, only one spot was pretty zappy at first when the needle was inserted. I shouldn’t have drank so much tea on my way over cause my bladder was on my mind the wholeeee time. lol. After acupuncture I arrived at the clinic 20 minutes early and got my blood drawn right away. I sat in the waiting room and listened to some more meditation. Soon enough it was my turn. It was the same nurse from last time, I don’t remember her name but she was very nice. She directed me to change into my gowns, hair net and hospital socks. I slipped my toe warmers into my boots for when I returned my shoes would be nice and warm. I went out to wait for the doctor, the nurse gave me a nice warm blanket and asked what kind of chocolate I wanted for when I was done, I got the dark chocolate :):):) seriously one of the best parts is the chocolate bar. After the doctor went over the embryo with me and verified my identity for the third time, the nurse walked me down to the surgical suite. The same room I had my last transfer, and egg retrevial, and hysteroscopy. I remember looking up a the ceiling crying for my egg retrevial I was so nervous about the anesthesia!! Today was a much easier day. The bed is comfortable with cushy leg rests, they tilted the bed so my bottom was up and my head was slightly down. I could still see the monitor for the ultrasound guidance. They used some warm gel to find the uterus, commented on my “perfect bladder” and “perfect fundus” lol weird weird compliments, I’m sure they probably say it to most women for some reassurance that things are going well. The lab technician came out and introduced herself and verified my identity one last time. The doctor inserted the speculum and catheter, once everything was in position they had the embryologist come out with the embryo. Moments later it was transferred. A small white dot was able to be seen on the ultrasound and they took the picture. I laid on the table for a couple minutes before going back out. They let me use the bathroom right after, and get changed. After that I left and went back for more acupuncture! Leaving the clinic I felt AMAZING. I have a little tiny perfect embryo inside me, my warm thick lining is absolutely ready to be a home!!!! I Listened to some more meditation and overall just tried to relax and ENJOY. The doctor had directed me to take it easy, even told me that I should not walk on the treadmill tonight like I usually do after my progesterone shot. I eventually got home and relaxed all day. I did some online christmas shopping. Made roast chicken and squash for dinner, now I’m in bed ready for sleep to come soon! The next 9 days I would like to make enjoyable and exciting, not going to dread and dwell on the unknown. Easier said than done I’m sure but today was a perfect day and I am so ready for this to be our take home baby! 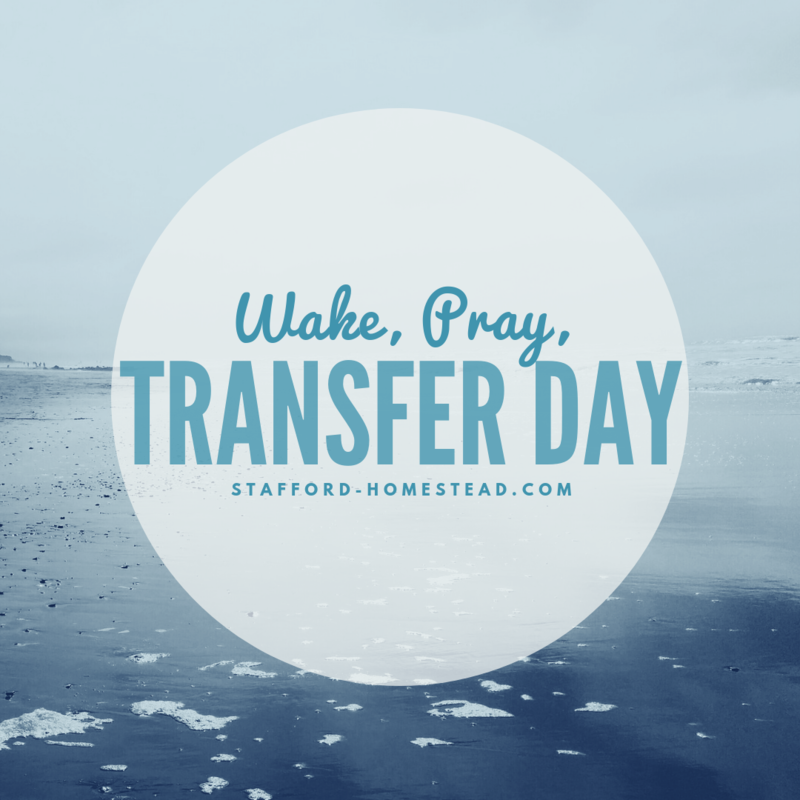 Previous Step By Step My Transfer Day Plan. Next What Happens After Embryo Transfer? My “TWW” FET #2. Thank you so much! Seven more days till I get my results.. feels like waiting for christmas morning as a child lol. Hope your transfer goes amazing! I hope everything went well, ill pray for you.